Industry estimates indicate that between 60-90% of new chemical entities exhibit poor solubility or dissolution rate. Effectively addressing these issues is essential for the development of drugs with adequate bioavailability, which is crucial if a drug is to provide the desired therapeutic benefit to patients. Capsugel is a leader in drug solubility and enhancement of solubility or dissolution rate. The depth of our bioavailability enhancement technologies makes Capsugel a leader in enhancing drug solubility and drug dissolution rate. We work collaboratively with our customers to apply these technologies to advance compounds with a wide range of properties and delivery challenges. Rather than relying on trial and error, we use a fundamental, model-based approach to select the best technology for each of our customers’ compounds. We build on that approach with formulation optimization, process development, and scale-up to advance medicines first to the clinic and then to commercialization. We provide customers with integrated product development services, from defining the problem to clinical and commercial scale production of micronized APIs / drug product intermediates, using enabling technologies such as spray drying, and/or finished dosage forms. This technology depth allows our product development teams to efficiently select the most suitable technology, demonstrate formulation feasibility, optimize formulations, and advance product concepts to clinical trials and commercial manufacture. Using our collective expertise in formulation science, we focus on the key physical and chemical properties of a compound and its dosage form requirements, working collaboratively with clients to develop tailored problem statements specific to each compound. These problem statements are used to guide preliminary decisions regarding selection of the best technology (i.e. drug-delivery platform) that offers the highest potential for performance, stability and manufacturability. Stability, flowability, dissolution rate and bioavailability (BA) are all critical performance parameters impacted by the size distribution of particles. Capsugel has extensive expertise in particle-size reduction technologies for solid oral and other dosage applications. Capsugel has developed an array of nanotechnology approaches for use in improving aqueous dissolution and solubility properties. Our Netzsch DeltaVita® media mill enables our Nano-milling process for the production of ultra-fine particles. As an integral complement of our liquid-fill hard gelatin and HPMC capsule technologies, Capsugel’s soft gelatin capsule technology brings a range of formulation and commercial benefits to pharmaceutical and dietary supplement products. 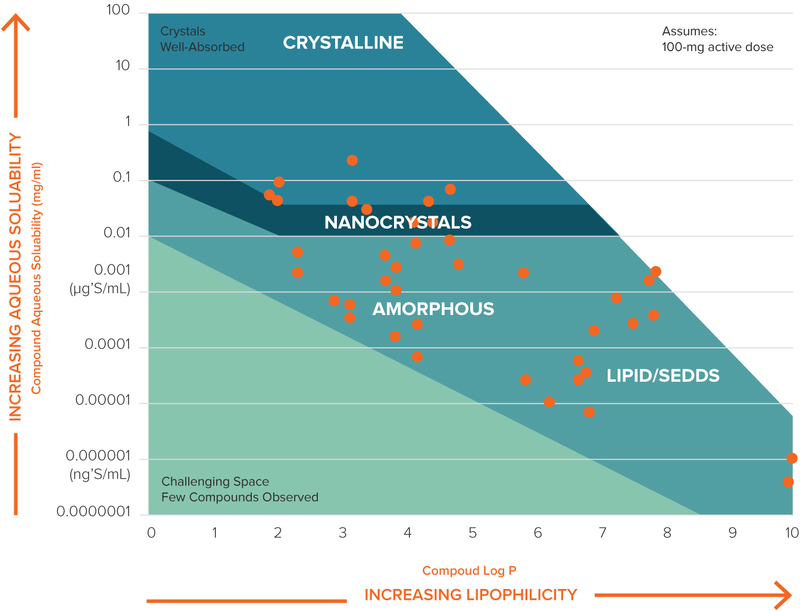 By combining Capsugel’s depth of solubilization technologies with our fundamental understanding of pharmacokinetics, we can rapidly help identify, prototype and optimize an amorphous solid dispersion formulation that improves the bioavailability of a low aqueous solubility drug substance. Our Technology Selection Methodologies – developed over years as we formulated and advanced more than 4,000 compounds – enable Capsugel product development teams to rapidly select the optimal technology and avoid or minimize trial-and-error approaches. Models and other tools have been developed to guide us in the design process, resulting in accelerated and optimized product performance, while minimizing program cost and complexity. Incorporation of Quality-by-Design (QbD) principles early in the product design phase ensures ultimate manufacturability of the formulation design. In addition, specialized lab-scale equipment has been developed that allows us to rapidly assess formulation performance with minimal API requirements. Our lab-scale process modeling capabilities and extensive experience in advancing compounds also facilitate rapid and efficient scale-up.